The al-8SB is a subwoofer designed specifically for use with the al-8 Line Array System. 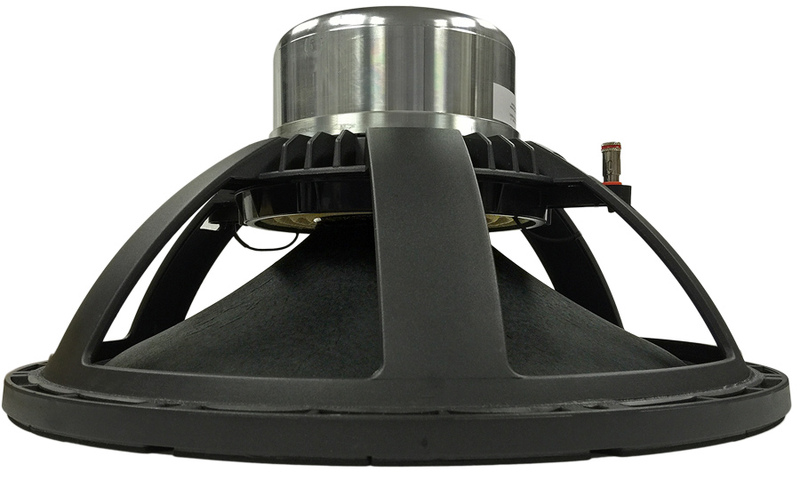 The al-8SB provides high output low frequency response from a compact and easily flyable package. When combined with an al-8 line array system, the al-8SB extends powerful and well defined low frequency reproduction down to below 35Hz. 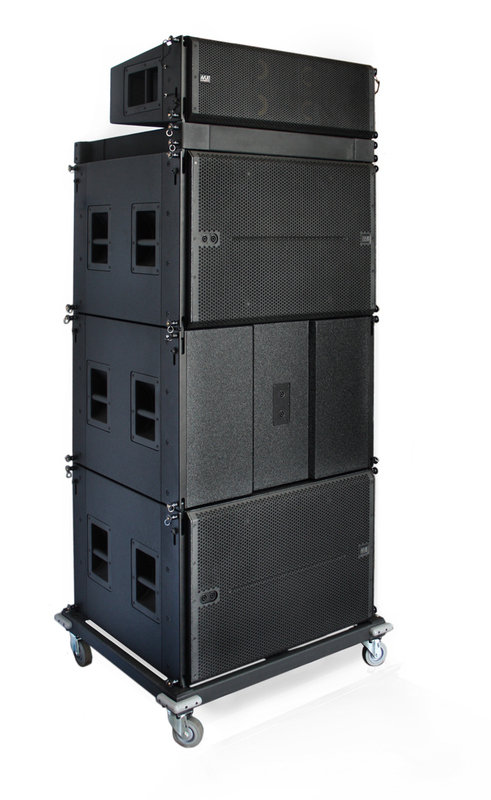 The al-8SB can be used in flown arrays along with additional ground stacked VUE subwoofers for applications requiring impressive low frequency output. Versatile integrated flying hardware and fly bars allows the easy assembly of ground stacked and flown arrays with al-8’s and al-4 for maximum flexibility. The al-8SB is designed to be flown as an array and supports cardiod configuration. The al-8-SB can be ground stacked with the al-8 three-way full range elements, as well as be flown together in a single array using four transition links with the new al-8SBFB (fly bar). The al-8SB enclosure is constructed of top quality birch plywood, coated in the same durable 12-step Dura-Coat LX finish as the al-8 acoustic elements. Extensive interior bracing ensures resonant-free low frequency performance. The machined, powder-coated steel grill with acoustically transparent lining provides ample driver protection while completing the refined al-Class aesthetic. Integrated suspension hardware ensures that the al-8SB is perfectly configured for use in any al-8 line array system in both flown as well as ground stacked configurations. Recessed handles and skids are standard along with recessed front and rear mounted dual Neutrik® Speakon sockets which provide easy input connection from the back in both conventional and cardioid arrays. Ultimate performance is achieved when the al-8SB is used with one of VUE’s VUEDrive Systems Engines. Custom al-8SB configuration settings are available (via SystemVUE software) to optimize the powerful processors for al-8SB arrays found inside the V4 and V6 engines. 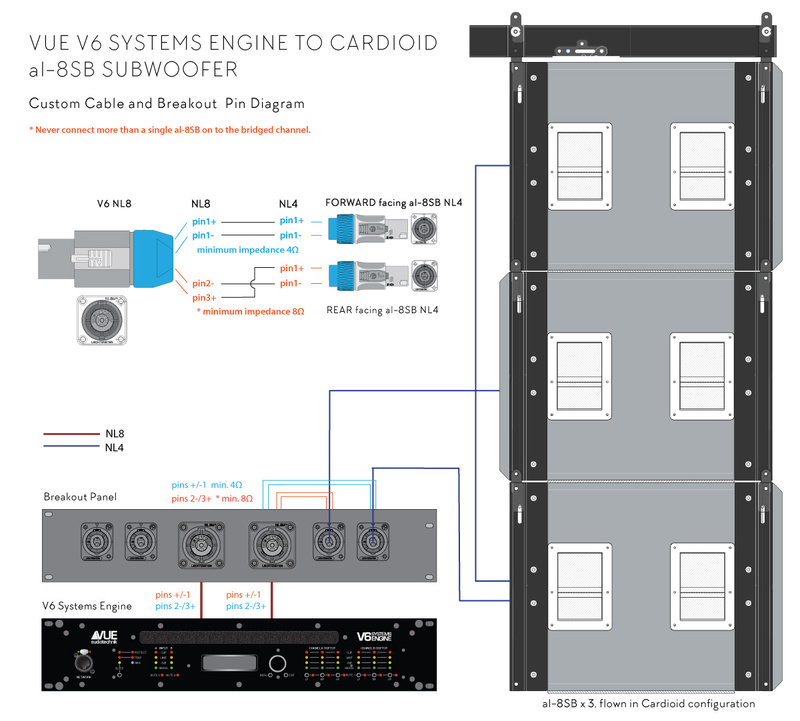 VUDrive™ amplifiers provide ample power for four al-8SB elements with the V4 and up to six al-8SB subwoofers in cardioid configuration with the V6. 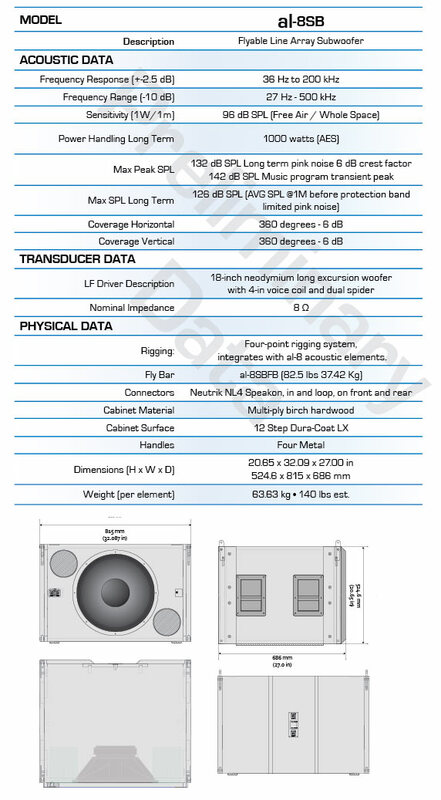 The system consists of the same ‘C18’ woofer with an ultra light-weight neodymium magnet which is found in the hs-28, housed in an enclosure which is exactly the width of an al-8 and the height of two al-8 three-way boxes. This allows for some visual symmetry between flown arrays of al-8s and al-8SBs as well as providing enough enclosure volume for the woofer to produce solid bass response. The suspension system is a four-point symmetrical configuration which facilitates the al-8SBs to be flown in a back-to-front pattern creating a cardioid bass arrangement. For neat cabling solutions a front input panel is located opposite the VUE logo to connect the reverse enclosure at the rear of the array. 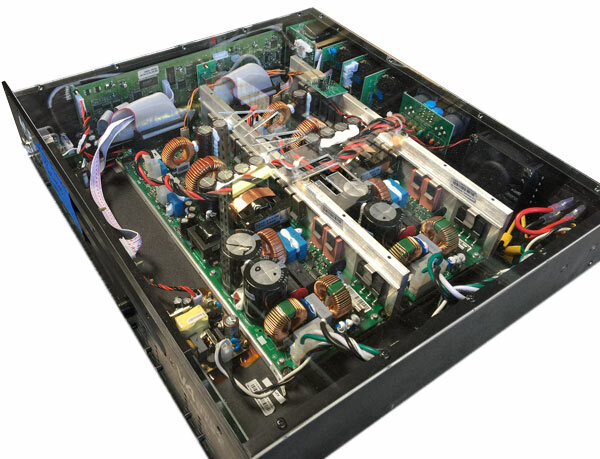 The al-8SB is integrated into the al-8 GLL making the design of al-8SB / al-8 system simple. 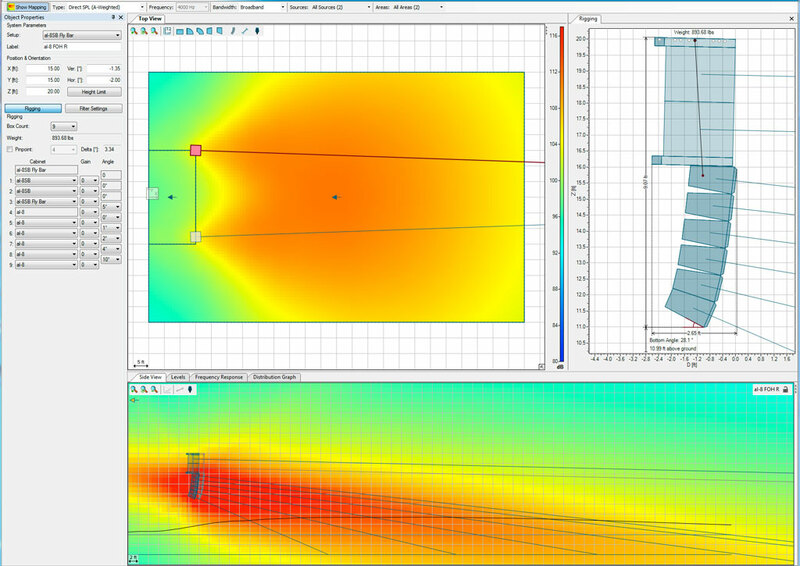 The current version only supports the physical aspects of the subwoofer (size, weight, angles, suspension and aiming) and with the introduction of subwoofer array support in EASE Focus 3.0 .